The city of Chania, the capital of the prefecture of Chania, the westernmost regional unit of Crete, is the most popular holiday destination in Crete and one of the most beautiful destinations in Greece. The old town of Chania is considered as one of the most beautiful spots on Crete, with its jewel - the charming old Venetian harbour of Chania, ideal place for a morning coffee, sightseeing, romantic walks in the evening, shopping and nightlife. Extension of the city, stretching to its west, lies the large coastal resort area of Kato Stalos - Agia Marina - Platanias where the frantic fun throughout the day and night, takes place in the beach-bars & clubs of the area. Apart from the beautiful old town and the cosmopolitan areas of the north coast near the city of Chania, the prefecture of Chania is ideal for day trips where you'll visit exotic beaches and will see remarkably natural landscapes. You will also travel to different periods of the island's rich history, on the occasion of the monuments that you will encounter. Among the many beaches of the prefecture of Chania, you will find some of the most beautiful beaches of Crete. Beaches with an infinity beauty, exotic, that compete with the world's best beaches. However, the sea of Crete, just as is the case with many other seas in Greece, are safe with warm and crystal-clear waters. 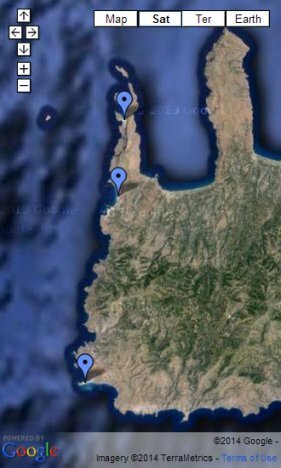 ...Can be seen in all tourist media, showing just a sample of the beauty of the westernmost prefecture and the island of Crete. Sooner or later, you will come up with the conclusion that only one day of your holiday's time, in each one of them, will not be enough. However, the natural scenic of Chania and Crete does not stop at the attractive beaches. Many times you will be given the opportunity to come close to nature, either during your daily trips, either when you're hiking in beautiful trails. And if you've never had the thought to go hiking during your holidays, just give it a second thought. The impressive Samaria Gorge located in the prefecture of Chania is not only for nature lovers and those use to hike. Furthermore, if you like hiking and if you're thinking to spend your holidays walking in Crete, apart from the Samaria Gorge, a multitude of other options of trails, which are located within the canyons or seaside, present a challenge to walk. 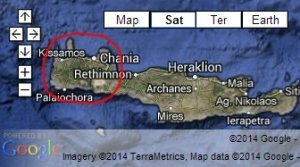 Most of them are situated in Sfakia region, on the southeast side of the prefecture of Chania. Moreover, other places where you'll see the beauty of the island are the green region of Apokoronas, where you'll find the only natural lake of Crete - Kournas Lake, as well as in many other spots on the road passing by or beside the canyons and descends with abruptly turns towards the sea. During your sightseeing around the city and during your day trips throughout the county, you will be given the opportunity to see many historical monuments of the island. Chania is a place where Minoans, Romans, Arabs, Venetians, Byzantines, Ottomans, Egyptians, Jews, lived, and they left their monuments, living example of the island's rich history. Visit sites of ancient cities of Crete, castles, historic monasteries and museums. Get a first taste of what you are going to experience during your holidays in the prefecture of Chania, Crete, through the video below. Wherever you decide to stay! Where to Stay in Chania? Decide which Resort is Ideal for You! To choose the right resort for your stay, depends on the kind of holiday you' d like to experience. If you are seeking fun and luxury, the more likely is that you will stay on the north coast. Conversely, if you are looking for peace and quiet, away from mass tourism, then probably the scenery at each resort will play a crucial role in your choice. Explore virtualy the areas mentioned below to see what each one can offer on your vacation. Get an overview of the options that you have. Most visitors stay in the north coast, somewhere near the city, in order to have easy and quick access to the old town of Chania, all hours during the day. The old town has many sights to show you, which is not easy to neglect and to spend your vacation at a beach, as beautiful though it may be. 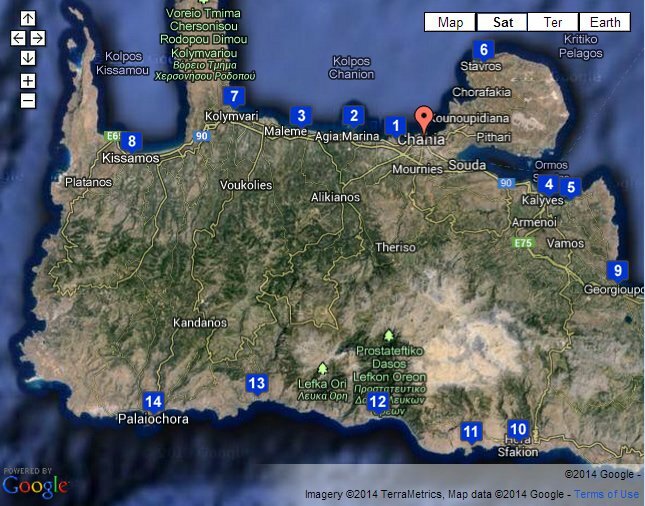 Perhaps, the only exception is the case, if you are visiting Crete for the second or third time. Therefore, if you want to combine on your holidays, evening and night romantic walks in the picturesque Venetian alleys of the old town, combined with daily excursions where you will be given the opportunity to go to beautiful beaches and visit the sights within the prefecture, take a look for your stay the hotels located within the city of Chania or somewhere nearby, perhaps in the area of Agii Apostoli 1 or somewhere around, or somewhere between Kato Stalos, Agia Marina, Platanias resorts 2 . All of these resorts are from 8 up to 16 minutes away by car or bus, and along these areas, you will find everything you are going to need regarding your holidays. Although in the west of the city of Chania, stands the resort of Platanias, just a bit to the west, in the resorts of Gerani, Pirgos Psilonerou and Maleme 3 , you will also find some large hotel complexes. A bit farther from the city of Chania (approximately 25 to 30 minutes), maybe you like one of the resorts of Kalives 4 or Almyrida 5 , which have a distinct charm. Perhaps the most secluded resort of Stavros 6 in the northernmost part of the peninsula of Akrotiri is the place for you, or Kolymbari 7 , where the northern coast of western Crete, meets the first of the two large peninsulas of the island. Finally, on the north coast of the prefecture, there are two other, more autonomous resorts. Kissamos 8 to the west, and on the other hand, Georgioupolis 9 in the east, which are approximately more than a half hour drive from the city of Chania, through the national road. Choose to stay on the south side of the prefecture if you are seeking tranquility and contact with nature, far away from mass tourism. The small traditional villages of Sfakia region, such as Chora Sfakion 10 , or the picturesque Loutro 11 and Agia Roumeli 12 which are only accessible by ferry, may be ideal, or maybe Sougia 13 is the place you're looking for. Sougia is a place where residents of the prefecture tend to visit on weekends for free camping on the beach. In all these places located at the south coast, there is a friendly atmosphere and the entertainment options are significantly restricted, compared to the northern areas near the city of Chania. An exception on the south coast is Paleochora 14 . During summer, enough people visit Paleochora for their vacation, because of its many lovely beaches, and Paleochora has much traffic yet the evening and night hours. Well, that's it. Find the perfect resort for your stay during your holidays time, according to your needs, and don't forget to do some daily excursions and visit other picturesque places and Cretan traditional villages within the prefecture of Chania.